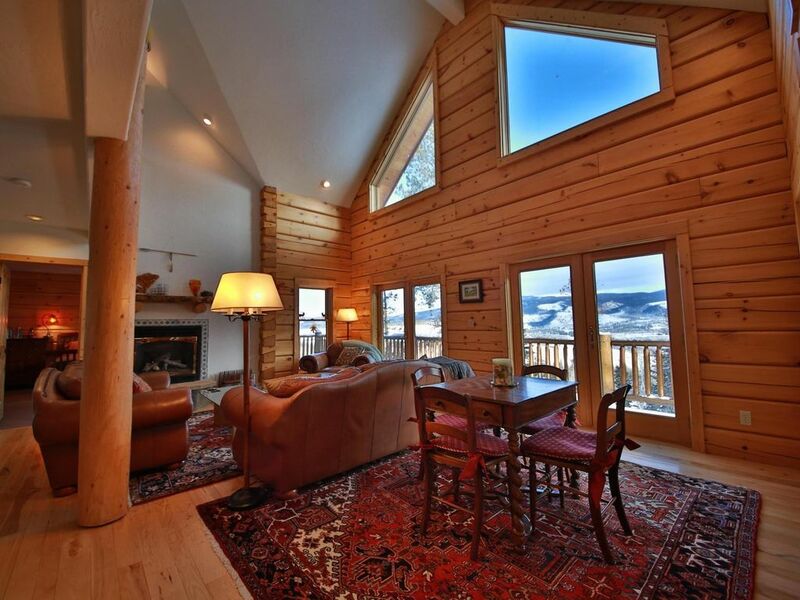 Our beautiful, recently built, Canadian-log home offers spectacular views of the Continental Divide, beds for an extended family of a dozen or more, and a fifteen-minute drive to Winter Park/Mary Jane ski resorts (the driveway and county road are plowed). The entire front of the house is spanned by picture windows and a deck. The alpine and Nordic skiing are world-class. In summer, the fishing, hiking, rafting, and mountain biking are superb (we have all the trail books and guides). We are especially interested in renting to responsible groups and families with a potential interest in return rentals. Jeff is Vice Chancellor of Undergraduate Services at the University of Colorado Denver. You can find him online at at the CU Denver English Department site. Judy is a Massage Therapist. Son Tyler works in Madison, WI, and daughter Emma works in Boulder. We chose the location because of its sheer beauty, relative isolation combined with convenient shopping and proximity to Winter Park/Mary Jane ski resort and the Rocky Mountain National Park. Whether skiing, boarding, hiking, fishing, rafting, mountain biking, golfing, tubing, horseback ridding, or just sitting on the deck soaking in the view of the Continental Divide, this is the place, at least for us. There is a jacuzzi tub. Within 5 minute drive to the Devil's Thumb Ranch and 10 minute drive to the Snow Mountain Ranch. Within five minute drive of central Fraser and Tabernash and 10 minute drive to Winter Park. Spectacular view of the Devil's Thumb Valley and Mountain and the Indian Peaks Range. Ski out for Nordic. Drive 15 minutes for Alpine at Winter Park/Mary Jane. Our dining room table seats 10 - 12, but we also have two game tables and 4 more chairs to seat 16 easily. Downstairs is where the kids tend to hang out. There is a foosball table, dvds, and two double glass doors to the outside. Pole Creek Golf Course is nearby. This house was great for our group of 7. Older kids enjoyed the basement with tv and foosball. Kitchen was well stocked. Easy access to Winter Park. Warning to late sleepers though, no curtains or blinds on windows in master bedroom or basement bedrooms. However, the view was amazing! We had a great time. Everyone of our family, all 13, had a great bed and plenty of room. We enjoyed the great views and the warm fireplace. The kids enjoyed downstairs and there was a chess match going on all the time. It was spring and the driveway was a typical mud season mess. We cleared the deck of the ice and snow and enjoyed time out there. We likely will return. Wish there was a hot tub to soak in after a day on the slopes. Thanks for sharing your home. Our stay was exactly what we were wanting. It gave us the Colorado cabin feel on a whole other level. Our views were amazing and had all the comforts of home. We had more than enough room for everyone to be comfortable. The only thing on the lower spectrum was the WiFi signal but not a deal breaker. Gave all of us time to interact with each other and not be on our phones a bunch. Thanks you for the great accommodations!! We are already talking about our next winter trip. This is a great home for a huge group of skiers. Three families could easily share this rental. The huge dining room table is perfect for big breakfasts and lunches. It’s a quick and easy drive to the slopes. View from house was beautiful and kitchen nicely furnished. No cable allowed for great family time. We really enjoyed our stay. The house met everyones needs. Our group was made up of 3 families. We all had our individual room and what we really liked was the lower level which is where the kids stayed. It was perfect because they felt like they had their own privacy. There was only one TV which was great since it was located where the kids were staying and it gave us adults some free and quiet time. We stayed there during Christmas and I was a little worried since I have 2 little ones. I didn't know how "Santa" was going to bring their presents. But it was perfect. They had a small christmas tree that was decorated which was great for us to continue our tradition of opening gifts under the tree. The kitchen had everything you need, coffee maker, pots, pans, etc. The location was also perfect. Only a few minutes away from town and Winter Park Resort which we very much enjoyed. We've had a bad experience in the past when renting through flip key and that place being double booked so I voiced my concerns to Judy and she reassured me everything would be ok. Our family is definitely thinking about coming back soon. 1. Go hiking. There are many breathtaking hikes nearby, ranging from easy to extreme. See the trail books and trail maps in the house. You can take an instant leisurely walk by just going down the hill from the house, turn left, and down into the valley. If you drive down the hill from the house , you come to the Devil’s Thumb trailhead, which provides gentle hikes in lovely alpine valley’s or strenuous hikes up to the top of the Continental Divide. Alternately, Monarch Lake offers lovely, gentle hikes for the whole family. 2. Go mountain biking. Shops in Winter Park and Fraser rent trail bikes. If you want a hair-raising experience, take bikes up the ski lift at the slopes and ride down. 3. Go fly fishing. Nearby are world-class fly-fishing sites, including the upper Colorado River. There are good fly shops in Fraser and Tabernash. 4. Go tubing or rafting on the upper Colorado River. There are rafting/tubing outfits in Fraser and Winter Park. 5. Go canoeing or just exploring around Lake Granby, Shadow Lake, or Grand Lake. Drive up to Grand Lake (45 minutes) and check out the options in that quaint little mountain tourist town. It offers canoe rental, homemade ice cream, gift shops, horseback riding, and the highest-elevation yacht club in the nation. 6. Go up to the Rocky Mountain National Park (immediately north of Grand Lake). The drive through the park is breathtaking, and you are sure to see elk, deer. 7. Go to Devil’s Thumb Ranch by Tabernash (10-minute drive from the house). They offer horseback riding, fly fishing lessons, a full spa with heated pool, massage, 4-star restaurant, etc. 8. Drive up to Kremmling to the Hot Sulfur Springs and melt into bliss. 9. Go to the giant alpine slides at the base of the Winter Park Resort slopes--fast and fun for the whole family. You also can take a lift up the slopes, and there is a restaurant on the side of the mountain. 10. Go to a musical or cultural event. Winter Park Resort hosts concerts and festivals off-and-on throughout the summer. Check online before you arrive or at the Information Center in Fraser or Winter Park. There’s a rodeo every Saturday night in Granby. 11. Have a nighttime campfire. There’s a fire pit in the backyard--good for story telling and marshmallow roasting. 12. Play games. There are a bunch of fun board games in the house, as well as chess, cards, jig-saw puzzles. 13. Check out the Fraser Valley Public Library—books, internet, and a good foreign film collection on DVD. 14. Just sit, sip a beverage, and gaze at the view, which is mostly what we do nowadays. 1. Go skiing/boarding, of course. In addition to world-class downhill, there is great cross-country skiing at the Devil’s Thumb Ranch or Snow Mountain Ranch. 2. Go sledding or snowshoeing, or build an igloo. 3. Go to Devil’s Thumb Ranch by Tabernash (10-minute drive)—Nordic skiing rental, horse-drawn sleigh rides (great at sunset), full spa with heated pool, massage, 4-star restaurant in an authentic, fancied-up farmhouse, etc. 4. Go to the hot springs. Drive up to Kremmling to the Hot Sulfur Springs and melt into bliss. 5. Check out the snow-tubing hill in Fraser—fast as greased lightening and fun for kids and adults alike. 6. Take a snowcat ride up the ski slopes by day or by night (great for older folks). 7. In the evening, ride the lift up from the Winter Park base to the Lodge and have cocktails with spectacular views or a great dinner on the slopes. 8. Make a nighttime bonfire. 9. Play games. There are a bunch of fun board games in the house, as well as chess, cards, jig-saw puzzles. 10. Check out the Fraser Valley Public Library—books, internet, and a good foreign film collection on DVD. 11. Just sit, sip a beverage, look out the windows, which is what we mostly do.